A structure that holds back soil or rock embankments, a block wall has numerous residential and commercial applications. With decorative and functional block walls in a variety of styles and forms, we create unique block walls for your needs and budget. 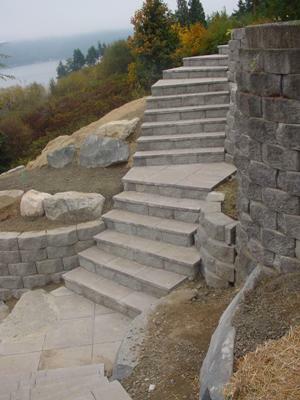 Flagstone Staircase with Retaining Wall, and pavers on walkways. 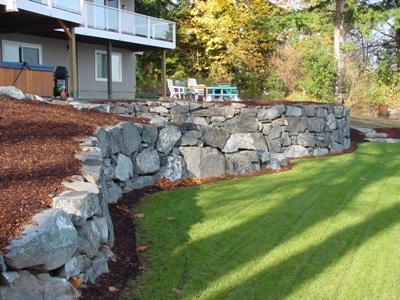 A rock wall adds a bit of rustic charm to your landscape while allowing you to curb erosion problems you might have from a steep slope. The rocks you choose will determine if your stone wall is formal or informal while being aesthetically pleasing and functional.